When it comes to 1950s pop culture, you don’t find many pairs more iconic than Lucille Ball and Desi Arnaz. As stars of the beloved TV comedy I Love Lucy, which ran from 1951 to 1957, they were responsible for depicting consistent and relatable comedy about the all-American lifestyle to an audience of millions, while also juggling their real-life relationship as husband and wife, mother and father, and co-producers. Along with I Love Lucy, Desilu Productions was a force in the early television industry, responsible for producing hit TV shows like Mission Impossible, The Untouchables, and, of course, Star Trek, as well as pioneering techniques still standard today, such as reruns and multi-cam sitcoms. Both of their careers improved after their marriage throughout the 1940s. Arnaz would find success in the States as a musician and bandleader, and in films like Bataan, Four Jacks and a Jill, and Holiday in Havana; Ball commanded sufficient recognition at this point that she appeared as herself in Best Foot Forward and Abbott and Costello in Hollywood, as well as performing in segments of Thousands Cheer and Ziegfeld Follies. At the time, with television still in its relative infancy, appearing on a TV show would be considered a massive step down for many movie actors, and the TV studios were attempting to dispel this notion by attracting bigger names. Ball was open to the idea, seeing it as an opportunity—she was a name, perhaps, but not really a headliner—but insisted that her husband Arnaz be included in the production. CBS balked featuring the pairing so prominently initially, thinking audiences wouldn’t buy her and Desi as a couple in the show. “What do you mean nobody’ll believe it?” she retorted. 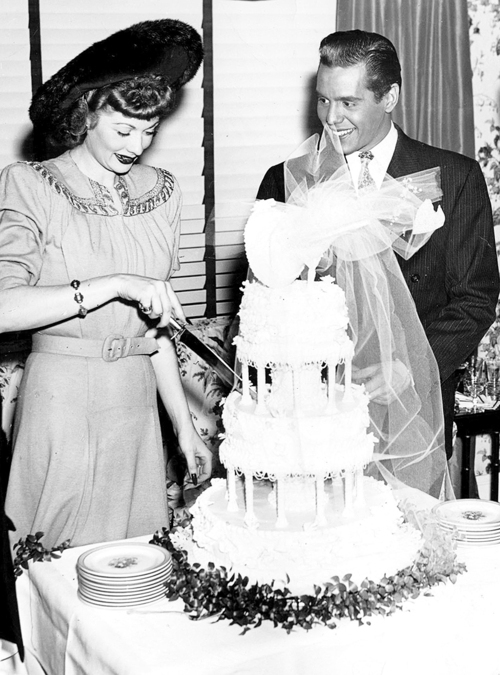 “We are married!” As Arnaz later described, working together had an added bonus for them personally: their respective successes in the movie and music industries had also had the unfortunate effect of dividing them onto opposite coasts, and they were on “the edge of breakup” when they came up with the idea for I Love Lucy. In a move that would echo their experiences throughout their career, I Love Lucy was at least partially the media solution to an off-screen problem. Fast-forward a couple years into I Love Lucy‘s run, and the show was enjoying unprecedented critical and commercial success. It was being watched in millions upon millions of households across America—the number one show in the country. So, in 1953, they decided to parlay that small-screen prestige into a feature film called The Long, Long Trailer. Though the studio fretted that audiences wouldn’t want to pay to see Lucy and Desi when they could see them weekly in their home for free, it needn’t have been a worry—The Long, Long Trailer ended up being one of the highest grossing comedies at the time, and earned MGM a tidy profit. Ready to road trip! First stop… the Thalberg Building at MGM? 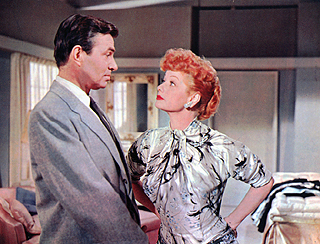 The Long, Long Trailer has a lot in common with the show… they clearly didn’t want to stretch the audience’s perception of the Lucy and Desi dynamic too far. Here they play newlyweds Nicky and Tacy Collini, who plan to set up their homestead in a trailer instead of a traditional house, to spend more time together, save money, and see the world. Things almost immediately start to go wrong though, and the Collinis find themselves having to deal with navigating the intricacies of their new marriage, while also attempting to wrangle the mechanical and physical demands of an enormous, unruly trailer. This is a bright, sunny comedy that leaves lots of room for Ball to show off her inimitable comedy skills, particularly in the physical realm. One great scene has her character attempting to prepare food in the trailer while it’s moving, becoming increasingly bewildered as eggs slip out of pans and oven doors yawn open when her back is turned. Her character’s penchant for collecting giant rocks as souvenirs (and her blundering attempts to hide that fact) is also used to great comedic effect. In the following years, the show remained popular, but Lucy and Desi’s personal relationship was suffering. Banking on the success of their earlier picture together, they decided to make another film; this one was Forever, Darling. This was an odd little picture that had been kicking around Hollywood for years before they took it up in 1957. Screenwriter Helen Deutsch had originally crafted it as a Myrna Loy/William Powell vehicle called Guardian Angel, but it went unused; later, Katharine Hepburn and Spencer Tracy were supposed to take the leads, but that project also fell through. By the time it got to Lucy and Desi, it wasn’t especially fresh or particularly designed to highlight their strengths as actors, so things weren’t really off to the best start in terms of this being a regenerative experience. Forever, Darling follows the life of a married couple for whom, to put it lightly, the magic has gone out. We see this cleverly communicated in a montage of front-porch scenes: two months after their wedding, Lorenzo heads off to work with a passionate embrace from Susan and a flower pinned carefully to his lapel; two years later, it’s a peck on the cheek and a hastily slammed door; and five years later, where our story is based, Susan is still snoring in bed, unaware of Lorenzo’s departure. Trouble in paradise, indeed. To try to reclaim some element of positivity in his life, Lorenzo decides to accept an exciting two-year, international field assignment for his job as a research scientist, and gives Susan the option to either travel with him or stay behind at home. Susan is aided in her decision by a semi-corporeal guardian angel (James Mason)—I won’t spoil who he’s supposed to resemble, as the reveal of that joke made me cackle out loud—whom she can see and hear, but nobody else can. Though she begins to fall for her handsome angel at first, he ultimately convinces her to commit to restoring her relationship with her husband. The second half of the movie cribs a lot from The Long, Long Trailer, with all sorts of pratfalls and misunderstandings and excuses for physical comedy plaguing their journey. But after the more serious drama and fantasy elements of the preceding story, it feels like a rather hollow, obvious attempt to recreate the magic of the previous film. Audiences didn’t take as kindly to this effort either—it was a big flop for the studio, and essentially dashed any imagined dreams for a film component being added to Desilu. Furthermore, Ball and Arnaz divorced in 1960, just three years after the film’s release, so, sadly, the film didn’t do much to salvage that relationship either. The title song did become a standard in their family though, with Desi singing the song at their daughter, Lucie’s, wedding. Despite the dissolution of their marriage, Lucy and Desi did remain friends—so maybe the title here really was an accurate description of their relationship. For many people, Lucy and Desi became synonymous with their well loved television characters, but their films also offer ample insight into their real lives. Though it would be a mistake to completely conflate real life with the fictional, there is something telling in the kinds of stories they were choosing to tell at what time—whether it was the story of carefree newlyweds exploring their new world, or a couple who loves each other, but is on the brink of disaster. Maybe that’s why it’s so easy to see them as their characters; the ultimate show people, they always added a little of themselves to whatever roles they played together. This entry is part of the Classic Movie Blog Association‘s summer blogathon celebrating the Fabulous Films of the 1950s! Check out the master page for all the participants and entries, which continue through May 26. I’ve seen bits of the Long Trailer and found them quite amusing, but I’ve never seen either of these films in their entirety. Ball was a wonderful physical comedian, but for me, I could have done without Desi. Yes, I Love Lucy was a huge hit, but just imagine what she could have done if she wasn’t always trying to help his career. I think you’d enjoy Long, Long Trailer, for sure! Lucy is totally the star and has a lot of long, extended sequences where it’s often just her doing a kind of silent movie-esque physical comedy routine! He came up with the three camera shoot for sit-coms, which was used all these years & is still used in most series. It was his idea to purchase rights & film the programs so they could repeated, which no one else had thought to do. Even Lucy herself always gave him credit for their success for the rest of her life. She was funny, but she said he was the one who would know what would be funny, & she’d just do it. He was so much more than just her co-star. I have to say that I have come to admire and appreciate Desi as time goes by. Of course it was all about Lucy, but he was talented, funny and pretty darn handsome. Apart they each might have found different levels of success, but together they were dynamite. Thanks for a charming review about one of my favorite couples (p.s. I am still not over the break up!). An interesting focus on the professional and personal persona of two hard working talents. That they still delight audiences and are interesting too us all these years later says a great deal about Lucy and Desi. 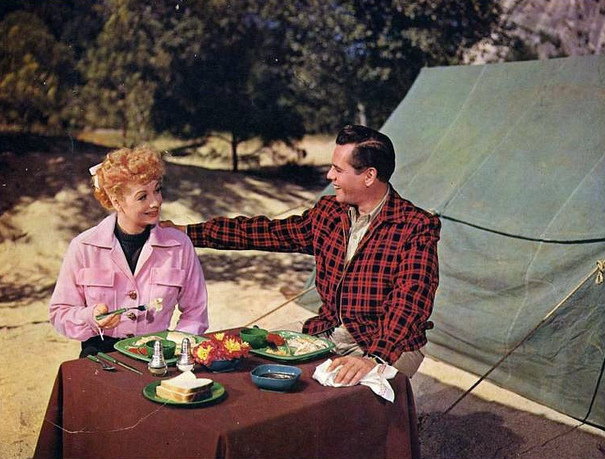 Lucille Ball films are a perfect addition to the 50s blogathon! I haven’t seen Forever Darling, but I think The Long Long Trailer is hilarious (especially the bit about Lucy hiding the rocks in it). Arnaz showed such a talent for physical comedy in this movie, almost as good as Lucy’s on their tv show. But your post has made me curious to see the later film, if only for James Mason. Enjoyed your post! I’m so happy to see both of these films and of course the Lucy / Desi collaboration as a part of this blogathon. I love both of these movies because of both of them, not necessarily because the films themselves are great. The Long, Long Trailer has many funny moments in it but I always wonder why they didn’t just make the characters the Ricardos. Forever Darling, because of the reasons you mention as far as paraleles to the stars’ real life, is bitter sweet and sometimes difficult to watch from that perspective. I mean, knowing the backstory of how difficult their marriage was at certain times. I haven’t seen these movies, shame on me, will correct that soon, but having said that, this was a great choice for the 50s since the couple loomed SO large in that decade on TV and as celebrities. Fun read. 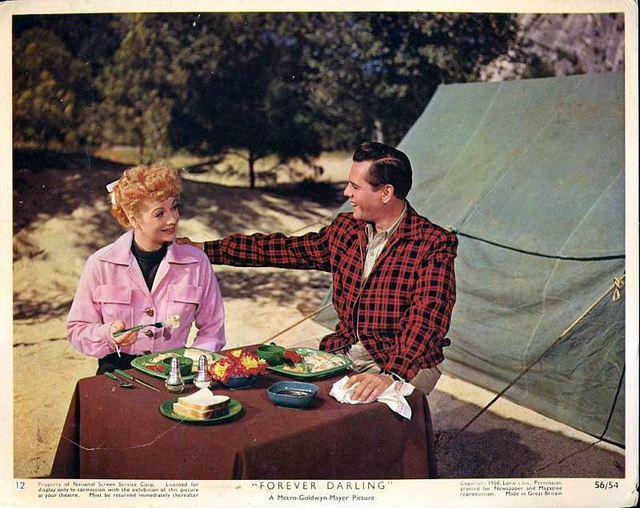 While I enjoyed your review of Forever Darling, I’m not as fond of the film. The Long, Long Trailer is my favorite Desi and Lucy film. Perhaps because it reminds me so much of my parents. 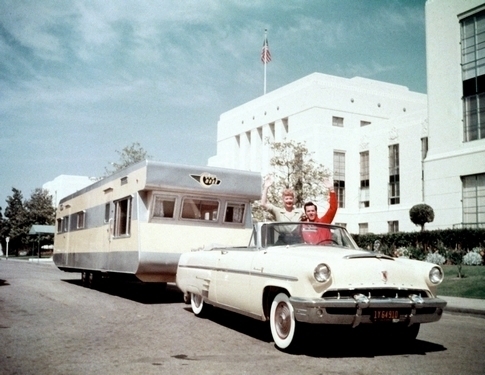 During the 70s we had a long travel trailer which my parents pulled behind a convertible Cadillac. Regardless of where we traveled during the summers, my mom had to collect something and drag it back. Sometimes rocks, seashells or plants. We had a fun childhood and this film reminds me so much of those times. Silly film but so much fun. Your selection of screen grabs brought me back and gave me a good laugh with their perfectly made table, topped off with that bouquet of flowers. So odd! I’m glad Lucy made the Blogathon and you’ve done a wonderful job with your two entries. Thanks for bringing these to my attention, Emily! I am a fan of I Love Lucy but somehow was never aware that the two made a movie together. The Long, Long Trailer especially sounds like it would be a fun movie to watch in the summer so I’ll have to plan on watching it soon. Thanks for this intriguing look at the Lucy and Desi movies. I’m kind of amused by the mishmash plot of Forever, Darling, which really does read like a throwback that had William Powell or Ronald Colman in mind. Desi Arnaz does not seem like the first choice to play a research scientist. Haven’t seen that or The Long, Long Trailer but the latter film does seem to have several fans so I’ll put it on my list. What would a blogathon about the fab films of the ’50s be without Lucy and Desi’s two feature films? So glad you spotlighted The Long, Long Trailer and Forever Darling, Emily. I happened to see both as a very young child with mom & dad & brother, but didn’t remember much about either one. Fortunately, TCM has aired The Long, Long Trailer and I watched it for the first time in years not that long ago. Loved it! What comedy magic those two had together. Would love to see Forever Darling again sometime. Hopefully, TCM will run a double-feature one day. Nice work!